Quiet home, wooded community, privacy and wildlife. All yours in this 'up to date' beautifully appointed house. A five minute drive to groceries and shopping, yet you feel completely secluded in this neighborhood. 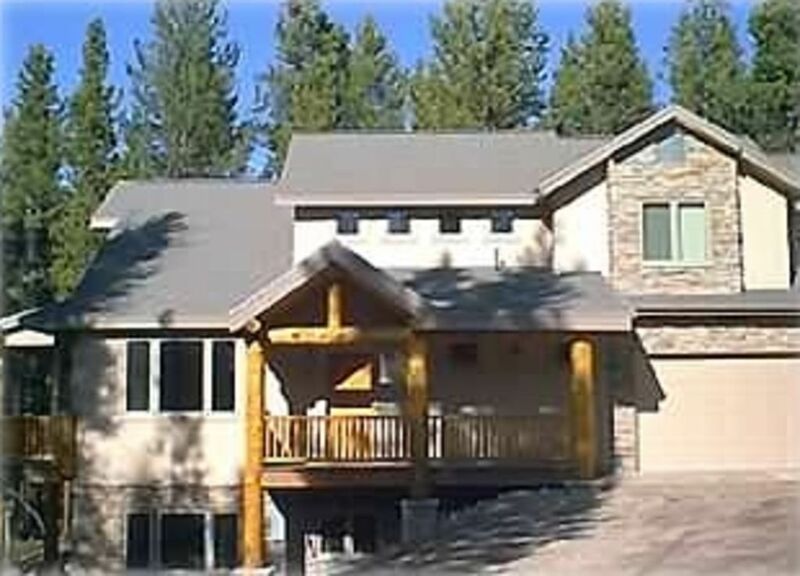 3 minute walk from hiking and mountain biking/ snowshoeing trail system as well! The house includes all the amenities you will need during your mountain vacation. Enjoy the private hot tub after your fabulous day in the Colorado Rockies and view wildlife from your own large deck: foxes, hawks, deer, elk and an occasional moose! You will find this home to be spacious, comfortable and includes all the amenties you will need during your stay.The kitchen is fully stocked with even starter necessities. Linens and towels provided. There are two TVs with DVD players, and free Wi Fi. Smoking is not permitted on the property, and pets are not allowed. Garage is heated and includes ski boot drier for your use! The master bedroom has a king-size bed, private bath, and satellite TV. There is a second bedroom with a queen-size bed and a third bedroom with two sets of bunkbeds. The bedrooms and a pull-out couch will allow sleeping space for ten. This home is centrally located in one of the most prominent areas of the Fraser Valley. Winter Park Resort, restaurants and shopping are only a few minutes away by car or free shuttle service. There are countless activities nearby to keep you busy during your stay. If you would rather kick back and relax, you'll find this home to be quiet, secluded, and comfortable. NOTE: THERE IS A CARETAKERS APARTMENT IN THE BASEMENT OF THIS HOME WHICH IS COMPLETELY SEPARATE FROM THIS RENTAL. Please call or e-mail Becky and Jim. We will be happy to help you with your trip to Winter Park. NOT WHAT YOU ARE LOOKING FOR? PLEASE SEE ALL OF OUR LISTINGS!! We love this area partly because it is so beautiful and conducive to outdoor fun and activity, and partly because the people in the area are great, the weather sweet, and the skiing fabulous! Dad, a business owner in Boulder, grew up ski racing at Winter Park, and we also participate in the mountain biking events offered there. Our home reflects our love for comfort, warmth and coziness, and includes details and art usually missing from most rentals. The quiet of the woods surrounding us (which we ask you respect as well) is truly peaceful and welcoming. Enjoy! Trina and Shannon Long, with daughter and son. Beautiful home on wooded property. Plenty of space for our 9 guests. We had a little trouble finding this house in the dark on the first night. But everything else was great. The kitchen is large and well-stocked. The rooms are comfortable and easily fit all of our guests. Initially the hot tub was showing an error and not heating, but we figured out that the water level had just gotten too low. And the property management company sent someone out on Saturday evening to help us troubleshoot. The problem was resolved same night and we were still able to soak away our sore muscles from a day of skiing. Thanks for a great stay! Beautiful house and great location. Would definitely stay again. We had a great time. The house is seclude enough for privacy but easy to get to the store.. skiing and movies. The house had everything we needed for our family. Six of us in the house and there was plenty of space. Hot tub was wonderful on a covered patio and great view! Will stay again. Close to everything but up on the hill in the woods. Beds were great, we had a fantastic time. I would rent this house again for sure. This house is a great house for two families with kids. The bunk room was perfect for the kids with a bathroom right across the hall. The weekend was very cold and being able to pull our cars/SUV right into the garage was really helpful. The hot tub was the perfect end to a long ski day. Overall we really enjoyed our experience.Also, the property manager Becky was very responsive and helpful! The few things that made our stay good but not excellent were little things that really make you feel like your at home. There was no sugar for coffee in the morning, the paper towels had three left when we got there and no back-up, we could not find any paper napkins or napkins at all for meals. The TV in the master did not work and both the TV's in the bedrooms were very old. We also had some bad luck in that the dryer broke the night before we got there. With 8 of us showering and using the hot tub we ran out of dry towels very quickly and had no way to dry our wet ones. We would rent this house again and just remember to bring the few particulars that were important to us. We have stayed here twice and love this home! The location is beautiful and home lovely, and the area is wooded and private with lots of wildlife. We saw moose in the lower yard this year, and elk prior. Our kids like to sled on the little hill next to the house too! The guy, Steve, in the apt below is barely around, but is super helpful if you have a question. He is new and doesnt smoke or have a dog. The best part, though, is the quiet and comfort of the whole experience. Lots of room and yet very cozy. We highly recommend it and will come again! Thanks! My family, friends and I stayed there this past winter and it was a GREAT place to stay!!! It was close to town, but it was tucked away in a nice secluded area. We saw a great family of foxes, which the kids enjoyed! Updated accommodations were a plus! There is a care taker downstairs, but we hardly knew he was there! We are looking forward to our next stay here next winter!! Thank you for your gracious review! So glad you've been happy there! We, too, love the quiet and privacy around the home, as well as the abundant wildlife and the surrounding apsen grove and trails. It was a wet summer and so promises to be an epic ski season. One night stays are only CONSIDERED.